Here at AGPROfessionals, one of the many services we offer is aid with financial planning for agricultural projects. Our development team can help you with customized assistance for new construction or improvements on existing structures. Our firm is equipped to provide you with the assistance you need to plan your financing and to properly manage the project. One area on your farm that might need some attention is your barn. Even small barn improvements can equal long term farm improvements. Some of these suggestions are simple tasks you can tackle yourself, without the need for investing large amounts of money. Other items on this list might require some financing. 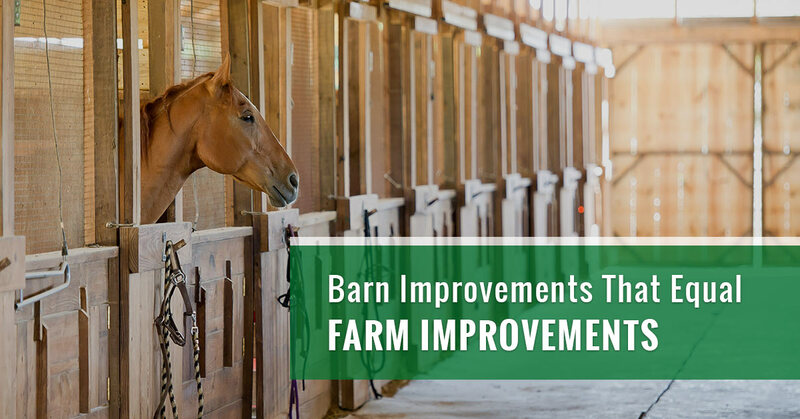 Read on for some of our top barn improvement suggestions. As we mentioned above, not all improvements around the farm need to cost you an arm and a leg. Some improvements simply require some hard work and a little bit of sweat (something those of us in the ag community are plenty familiar with). One of the first steps you should take is to get your barn organized. This is an excellent activity for a slower part of your agricultural season. It can be easy over the years to accumulate junk, to become disorganized, and to give up on any semblance of a system for your barn. However, an organized barn will not only provide you with greater efficiency in your work, it will also provide improved safety. Begin by removing anything from your barn you no longer need. You might be surprised what you unearth when you take the time to purge your barn of excess junk. After you have rid your barn of unnecessary clutter, you can get to work creating an organized system for what you do need. Make sure you keep items you use often easily accessible. Tip: This is a great activity for the whole family. Even young ones can help you clean up, organize, and get rid of unneeded items. Not only will this provide you with some extra helping hands, it will make sure everyone is on the same page for keeping things organized. One area that should always be a top consideration for upgrading and renovating is your barn flooring. Overtime the flooring in your barn will sustain damage due to normal wear and tear. If you house animals in your barn, this is particularly true. Upgrading your flooring will not only help your barn look fresh, it will keep your farm safer. If your barn flooring is beginning to crack or the floor boards are becoming warped, consider upgrading to a newer, more durable flooring material. Cracked flooring can pose a serious risk for both you and the livestock you house in the barn. By replacing the floors, you can improve the appearance of your barn without investing in a complete overhaul of the barn. This improvement will be well worth the investment, particularly if you pick a material that is designed to withstand heavy use. Determine how much traffic you have entering and exiting your barn on a daily basis, and choose a flooring style that will meet your specific needs. Another feature of your barn that should be a focus of your upgrades are your barn doors. The doors on your barn not only dominate the exterior appeal of your barn, they also function as an important safety feature. Upgrading your barn doors will allow you to store things securely and to keep animals protected from the elements. Barn doors that no longer create a tight seal will allow heat to escape your barn during cold winter months. If your barn doors are difficult to open and close, a simple upgrade can save you time and make your day to day operations easier. Whether it’s your barn that needs an upgrade, or another feature of your property, our team at AGPROfessonals can help you plan the financing you need. Reach out to an agricultural consultant on our team for assistance planning your property upgrades.